London, UK - Grand Cru Studio is a unique space, inhabiting a 100 year-old, 110 foot Dutch Barge moored at St Katherine Docks in the centre of London. While its current incarnation as a fully commercial facility is a recent transition, the studio itself has been around a long time - originally called Oceanic Studios and commissioned by Pete Townshend in the late 70s it was a valued part of Townshend's Eel Pie Studios. Over the last five years it has been brought back to its former glory and equipped to deal with a flurry of Townshend projects including the acclaimed Classic Quadrophenia. The most recent investment, heralding the studio's new name and new commercial status, is an SSL AWS 948 hybrid console - a combination of classic SSL SuperAnalogue™ console technology with comprehensive DAW control hardware in a single work surface. At the helm is Myles Clarke, an Engineer and Producer who has worked closely with Townshend over many years and the man responsible for re-energising this creative and versatile space. "I am running this as a traditional commercial studio," he says. "...A production space for hire. "When you arrive, the desk is zeroed - everything is clean and tidy... I want it to be like the studios I assisted in and learned in - a fresh blank canvas for producers and engineers to come and do their thing in. "I've been to lots of so-called commercial studios that are actually very much a Producer's own studio - things are broken or labelled badly, and so on... I've spent the last few months making sure that this place is perfect." The studio makes great use of space in the Barge, with a large control room, plus live area and smaller machine room / booth. The rooms remain true to the original Keith Slaughter designs (Abbey Road, Ridge Farm, Air), even though some of it had to be reinstated: "When I came to the studio lots of the bolt-on wooden panels had been removed and it sounded awful" Clarke explains. "Pete remembered the panels. We actually found them all in a warehouse, covered in dust, so we cleaned them off and screwed them into exactly the same spots. We knew which went where because the screw holes lined up! "Suddenly it diffused the room, stopped some of the standing waves... It was just like magic." The studio has been gradually re-equipped over the last five years, constantly adapting to a wide variety of projects that have occupied Clarke. As a result, the microphone, monitoring, outboard, and backline lists are impressive, along with the new SSL console. "The SSL is the thing that brings it all together," says Clarke. "The SuperAnalogue Mix Bus sounds great - just amazing… And the compressor is clean and transparent. "The way it's set out, the way that it sounds... You just know you can push a bit more, cut a bit more… And you can do that dramatically. Pete's always talked about shaping the sounds on an SSL and I agree - you can really 'build' a sound with an SSL. "Of course there are other desks, and you might be able to get a nice tone out of those, but it's difficult to properly build a sound on anything else... When you've got lots of things happening the SSL is surgical but creative… You can be absolutely confident and do what the hell you want! The inputs then meld together beautifully in the mix bus. 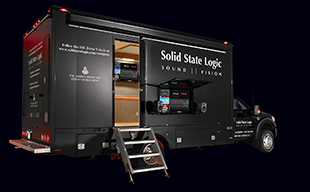 "With the SSL you can get to the core of the sound. It's the best thing to make your music sound either as natural or as messed up as you want." Even though the AWS 948 is a 48 channel console with full 5.1 monitoring, at less than 1.5 meters wide the footprint is the same is the 24 channel version, thanks to the Dual Path Channel Strip design. This suits Grand Cru well - giving a high input count without taking up too much space, and providing the versatility of three distinct operating modes, including the Stereo Mix mode that is particularly suited to modern production mixing. "If I had a 48 channel console with a 48 channel footprint, people would struggle to get past it," notes Clarke. "The AWS has a very suitable footprint for this kind of studio." “It's an all-round production studio. A lot of the projects where you're co-writing and developing material, you need a production studio but you also need fantastic gear; you need some great mics, great monitoring, and a great console. If you've got that, you can make a record, and it's worth hiring a space for that.